Today, around 2pm, I entered a printing shop in hopes of getting a demo copy of the Neo-Alpha preview book in paperback form. To my surprise, it was finally in my hands. A physical copy at the price of 18,000 South Korean Won, which is a little similar to about $18 USD. I walked with it practically all day and showed it to friends/coworkers, and they thought it was pretty great. Keep in mind, this is the very first print of my book. The cover was in color and the pages were in Black and White. Fast forward to about 8pm later that day. I went into a candy shop to buy a few goodies and call it a night. Thinking I would be in-and-out in a short moment, I was wrong. The cashier asked me about my book, “Is that a comic book?” I told her no and that it is an unfinished action novel. She continued to ring me up and ask me what was the book about. I told her simple details and that it was an “action and fantasy story… basically, a superhero novel”. She told me that she loved Iron Man and I then told her I am writing the book “Yscariot”. She was amazed and complimented me for being the first person she has ever met that was writing a book and even expressed the hope in reading it. She even said that she feels that this story is going to be a big hit and says that I will one day be famous. Now I cannot say that I believe her, but I can safely say that my faith in myself has increased dramatically because of this random incident. Keep this in mind as well: the girl is a young woman who looks about 20-21 years old and spoke really good English for a Korean. Anyways, I set the book inside of a bag that I placed my candies in, but then I thought about it, and decided to give her the first and only copy of Yscariot: Neo-Alpha. She seemed to be more enthusiastic about the book than anyone I know personally. Hopefully, more people will start to follow it and the word of mouth gets bigger and better. Ya esta aqui ! La edición de “Yscariot: los versos beta” en Español. Ahora disponible en GooglePlay y en PDF. Haz click a estos links para descargarlo a tu dispositivo digital. ¡¡Corre la voz!! ¡Gracias! – A translated version of the Beta Verses (Versos Beta) in Spanish! Hola Followers y Lectores! 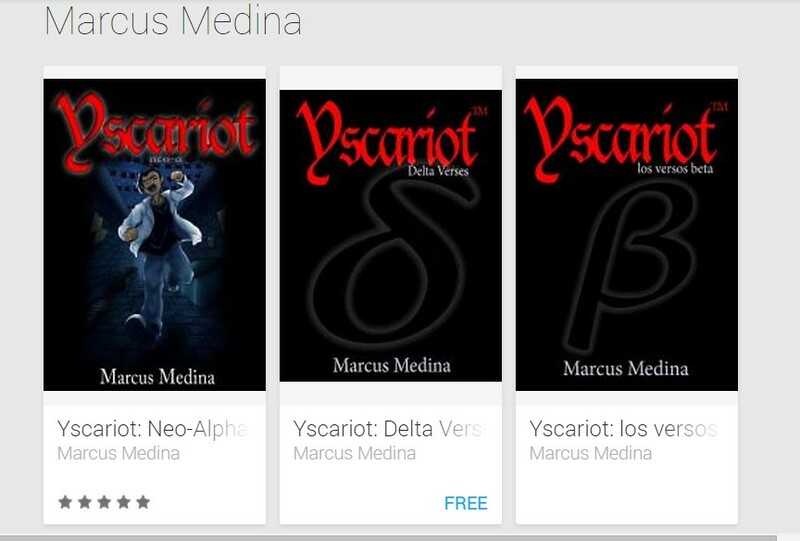 Soy el Autor de Yscariot, Marcos Medina, y estoy muy feliz de finalmente anunciar una edición original Beta Versos en Español. Este sera un preview de 3 capitulos y sera gratis. Espero recibier algunos comentarios de ustedes que puedan ayudar para una futura version. Gracias!